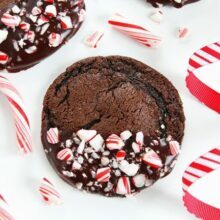 Chocolate Peppermint Ganache Cookies-chocolate cookies dipped in chocolate ganache and sprinkled with candy cane pieces. The perfect holiday cookie! Give me a chocolate cookie and I will be a happy camper. Give me a chocolate cookie dipped in chocolate ganache and I will kick up my heels. Give me a chocolate cookie dipped in chocolate ganache with candy cane pieces, I will turn on the Christmas tunes, do a little dance, and smile for days. 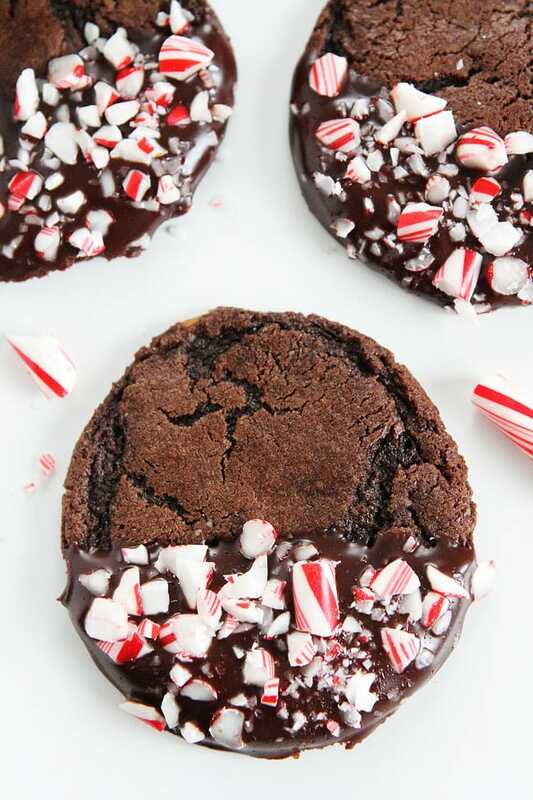 These Chocolate Peppermint Ganache Cookies are the ULTIMATE holiday cookie! I love chocolate and mint together any time of the year, but especially during the holiday months. These cookies are perfect for all of your holiday parties, cookie exchanges, and cookie cravings. 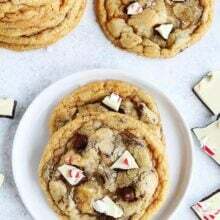 You really don’t need a special event to make these cookies, but if you want to share them, your friends and family will thank you! The chocolate cookies are rich, fudgy, and dotted with chocolate chunks. Like I said, they are good on their own, but after they take a dunk in the silky chocolate ganache, they are heavenly! 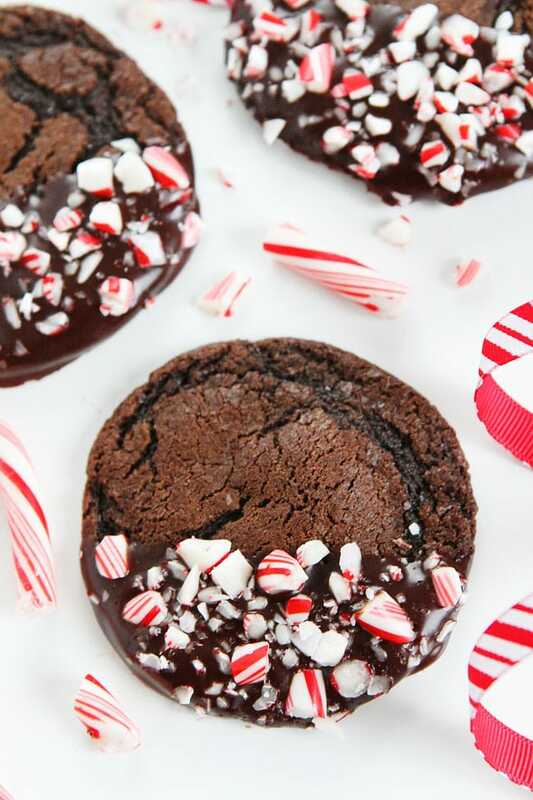 Add these Chocolate Peppermint Ganache Cookies to your holiday baking list! They are sure to make your holidays sweeter! Chocolate cookies dipped in chocolate ganache and sprinkled with candy cane pieces. Everyone's favorite holiday cookie! Gradually add flour mixture and beat until just combined. Stir in the chocolate chunks or chips. Scoop the dough into rounded tablespoons and place on prepared baking sheet, about 2 inches apart. Bake cookies for 10 minutes, or until cookies are set, but still soft in the center. Don't overbake. Remove from oven and let sit on baking sheet for 3 minutes. Move to a cooling rack and cool completely. While the cookies are cooling, make the ganache. Add the chocolate to a large bowl. Heat the cream in a small saucepan over medium heat just until it bubbles around the edges. Remove the cream from the heat and pour it over the chocolate. 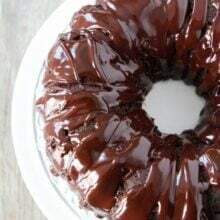 Let the mixture stand for 30-45 seconds, then stir until the chocolate melts and a smooth ganache comes together, about 1-2 minutes. Lay out a large sheet of parchment paper or wax paper. Dip the cookies, halfway, into the warm ganache. Place the dipped cookies on paper. Sprinkle with candy cane pieces. Let cookies sit until ganache hardens, about 2 hours. To speed up the process, you can place the cookies in the refrigerator to chill. Note-store cookies in an airtight container for up to 4 days. I’m already drooling over your words, “rich, fudgy, and dotted with chocolate chunks.” I mean, COME ON!!! These look delish! They are definitely the perfect holiday cookie! 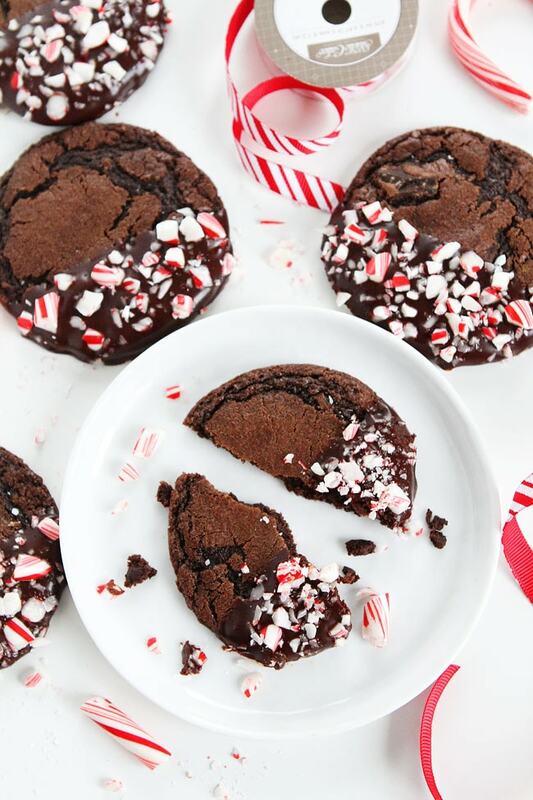 Love the candy cane and chocolate – these cookies – I could eat a 10 or 20 by myself! Easy peasy and another keeper from the cookie queen! these are so cute and festive! YUM! are these like chocolate crinkle cookies? The chocolate cookies are rich, fudgy, and chewy. The chocolate ganache adds an intense chocolate flavor and is silky and smooth. The candy canes add a nice peppermint crunch. I hope that helps! 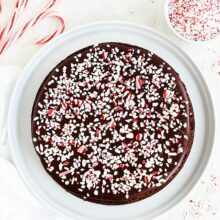 can these be frozen or will the peppermint melt into the ganache? I have a batch in my freezer right now! I have pulled a few out to enjoy and they still taste great! These cookies are beyond beautiful!! Pinning! Maria, these cookies are the bee’s knees! 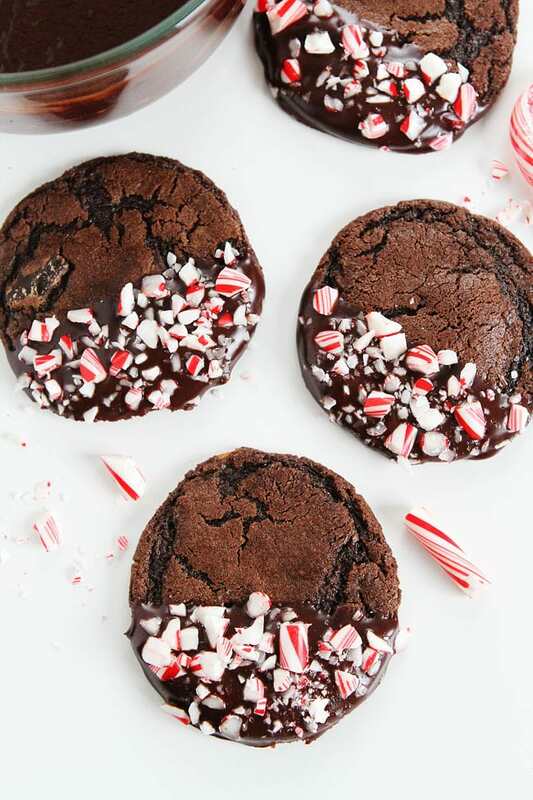 Fudgy chocolate, peppermint, and ganache – these ARE the ultimate holiday cookies! Thanks for the recipe!! These look amazing! What are your thoughts on making them in advance? I’ll need to make them a few days ahead of time. Would you recommend freezing the finished cookies? Freezing the raw dough instead? How long do you suppose they’d stay good at room temp in an air-tight container? You can make them in advance. They will stay good in an airtight container on the counter for 3 days. If you have a warm house, you can keep them in the fridge. Let them come to room temperature before serving. I have a bag in the freezer and they taste great frozen:) You can also let them thaw before serving! Lots of options. I hope you like them! Love these Maria! Happy holidays to your family!! What a perfect treat to add to the Christmas festivities! I can’t wait to put these on my party table. Thanks! I just made these and ate one without the ganache and they are a delight. Thanks for the recipe! Can you swap out peppermint extract for the vanilla to make it a peppermint chocolate cookie? Thanks! You can add peppermint extract to the dough. I would put 1/4 or 1/2 teaspoon, depending on how minty you want the cookies. 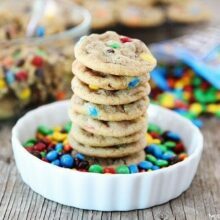 I would love to try these cookies this week! Do you think GF flour could be used? I’m new to the GF lifestyle and have not had much baking success substituting GF flour, etc. I haven’t tried making them GF, but I do like the Cup4Cup gluten-free flour. Maybe try that! Can these be frozen to store? Can I use regular Hersheys cocoa powder instead of Dutch processed? Sure, the cookies won’t be as dark in flavor or color, but still really good! I haven’t even put the ganache on, but tried one of the cookies and I let out an involuntary “oh my gosh”. It was a mouthful of soft, fudgey chocolate goodness. I used bulk store cocoa (12-15%) and dark brown sugar with them and they were still delicious. I’m almost hesitant to dip them because they already taste so good! Yay! So glad you liked the cookies. They are so good! This looks so good! Thank you for sharing this recipe, Will need to try it soon. I’m ready to go make this for dinner tonight! It looks amazing, my friend! These are so delicious – they smell like fudgy brownies, drooool. I did opt to halve both the brown and granulated sugars, since they were dipped in more sugar, and I’m really pleased with how they turned out. These chocolate cookies looks beautiful and yummy! I will be trying this recipe when I get home. Thank you for this one! Your recipes NEVER disappoint! Everything I’ve tried from your website has been delicious! I can’t wait to try these! These are a Christmas favorite in my house! Thanks for such a fabulous recipe! The taste of these cookies was awesome, but I had a problem in the baking process that I am trying to figure out. The cookies were quite dense and didn’t want to flatten. The taste was perfect though. Could my problem have been over mixing the batter?